Principles of Entrepreneurism from Martin Luther King, Jr.
Dr. Martin Luther King, Jr.’s greatest contributions come from his work as an orator, a civil rights activist, and his continued positive impact on society forty years after his death. However, generally speaking, his influence on humankind and our culture is much further reaching than at first glance. 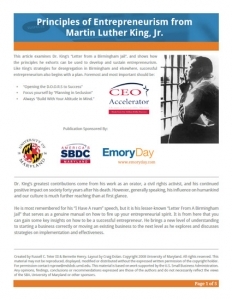 Principles Of Entrepreneurism From Marin Luther King, Jr. examines Dr. King’s “Letter from a Birmingham Jail”, and shows how the principles he exhorts can be used to develop and sustain entrepreneurism. Like King’s strategies for desegregation in Birmingham and elsewhere, successful entrepreneurism also begins with a plan. Read more about how to adapt the strategic planning needed to help grow your business, and become a successful entrepreneur. Fill out the form to the right and Download our whitepaper NOW!